How to detect Mozilla Compatible Agent traffic from bots. Whilst auditing the Google Analytics account of one of our clients recently, I came across a curious thing. 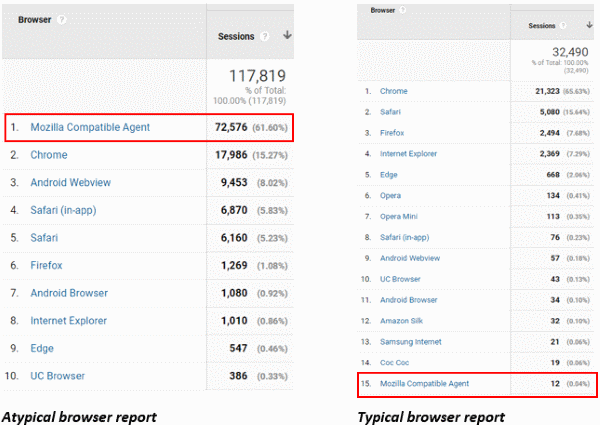 The GA browser report showed that more than 60% of sessions occurred via the browser Mozilla Compatible Agent. In most Google Analytics accounts Chrome, Safari, Firefox and good old IE typically tend to top the browser list, and Mozilla Compatible Agent represents a tiny fraction of the total traffic. But in the case at hand, over 60% of traffic came via this browser. My curiosity was triggered immediately. Time to get my analyst hat on and dig deeper! I then analysed via which service provider all that traffic reached the site. It turned out nearly all of it came via a single service provider called ‘customer lan subnet’! Having experienced similar behaviour with another client recently, we found out that monitoring was installed by the company’s risk auditors. This automated routine constantly pinged different pages on the site, and then left immediately. Something similar seems to be going on here. Although we cannot be a 100% sure of the origin of this traffic, we are confident that this sudden spike in traffic, with all of the characteristics described above, is caused by bots which emulate the user agent Mozilla Compatible Agent. The only alternative explanation is a sudden rise in mobile traffic where MCA can be a genuine user agent, which for sure is not the case here. How to assess your analytics are impacted by an MCA bot issue? If you see a sudden spike in traffic to your website, check which browser and service provider combinations are sending traffic, as illustrated above. If you see a lot of traffic coming via MCA, and a particular service provider (this can also be the name of an organisation, e.g. Microsoft), you more than likely have a bot traffic issue on your hands. How can you deal with a Mozilla Compatible Agent issue? In the case at hand, the bot filtering option in Google Analytics had been checked. This was obviously not enough to keep this bot traffic away. Create a custom filter to permanently remove traffic from that particular service provider, in this case ‘customer lan subnet’, from your data. This will remove any traffic from that bot going forward. Since retroactive removal is not possible using filters, we recommend you also create a segment to filter traffic from that particular service provider from your reports. This segment will also work retroactively. PS: If you want to go all the way, you can modify your Google Analytics tracking code such that it does not even collect data from that Mozilla Compatible Agent. This requires a little coding knowledge. Be aware though that some of that MCA traffic might be legitimate, which will not be collected in that case. Cheers for the read- your post reminds me of an incident I experienced a little while back at work. In that instance, four otherwise quiet sites they run displayed exponential traffic with an almost total bounce rate and zero dwell time. I’d identified service providers in cities from the US, Europe and Africa that were hitting them over a three week period. Part of the problem was a simple, yet preventable one- none of the Google Analytics accounts affected had their bot filters running, something overlooked by my predecessors. This has led to me commencing a review of the entire GA/GTM presence to map and account for all data streams, clean up the presence and ensure the data’s integrity. While it won’t resolve all the issues I face in general, it’s a good start, as is the idea you’ve raised of adding a custom filter, which should account for some of the gap between what Google can immediately identify and what is a little harder to identify. At what point should you become concerned about fake data and it’s effects? Is there a threshold you apply before you act, or is it a case of act on alert (if one is applied)? Are there any URLs or service providers I should be mindful of from your experiences? Thanks for the comment Jason! In response to your question I guess a lot of this can be prevented by just regularly reviewing your data (monthly, if not weekly) and questioning anything that appears to be out of the ordinary. If you’re dealing with an exponential increase of traffic as you say from one day to the next you will then detect this early on. Since I review my data pretty much daily, I don’t use alerts very often. But you absoIutely could setup an alert for Mozilla Compatible Agent traffic. Leaving campaign launches aside I guess it is fair to say any increase of, say, 10% should already sound the alarm bells. I recommend you tick the Bot filtering option in your GA views, though that was done in the above case and still junk came in. I have seen this particular issue happening with different service providers so I wouldn’t single out any. Bottomline: check your data regularly to detect extraordinary changes early on and act on them! I’ve heard of the 10% threshold and sounds like a good place to start. I review all site data monthly at this stage, but am planning on weekly, monthly, quarterly and annual reviews as part of site performance benchmarking and improvement activity. Thanks for the idea, this definitely gives me something to consider in terms of when to act, with some idea on how to act! When Do I Gate Content For Lead Generation?